You have probably heard of apps that pay you for watching video ads. There are many apps that earn you rewards for just watching video ads. But the issue with those apps is that it's boring and reward per video is very low. Bermi is an app where you can earn rewards for watching fun-videos, not video ads. You won't earn a lot. But it's decent considering you won't get bored. Videos on Bermi are similar to the ones you find on tik-tok. All you have to do is open the Bermi app start watching videos. For every 30 seconds you watch videos or browse the app you can claim 1 Berm(point). You can also earn 30 Berm when you check-in. If you check-in for 7 days in a row you will earn 200 Berm on the 7th day. You can also play betting-based games and win more Berm. For every friend that you refer, you will earn 100 Berm plus 30 Berm every time your friend earns 100 Berm. Your friends will also get 100 Berm when they enter your invite code. For every 100 BERM tokens your buddies earn, you will earn an additional 30 BERM. Come back every day to claim your earnings. The best way to earn referral bonus is by sharing Bermi in WhatsApp group chats. 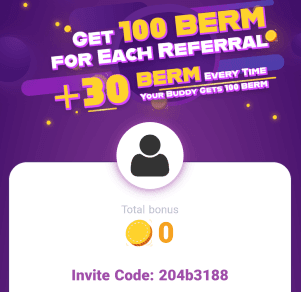 Share Bermi to your friends, family, colleagues, and classmates so all of you can earn together. If you are not asked for invite code go to your profile tap "Redeem Token" and enter the invite code. You can use the Berm you earned by watching videos and other tasks to buy tickets. You can buy 1 ticket for 100 Berm. Every ticket has some cash prize. No ticket is empty. You can withdraw your earnings to any ETH(ethereum) wallet. Minimum withdrawal: 0.02 USD. Berm is a great app to earn some cash while you do something just for fun. You’re entertaining yourself and getting some cash out of it. That’s not bad. Do you know any other apps like Berm?